Becoming one another’s primary emotional confidant because a) it feels comforting and because b) that’s the role of a girlfriend. Clue to understanding the parable: ‘Fadoption’ represents having a boyfriend/girlfriend. ‘Adoption’ represents marriage. We don’t like all the background checks of the adoption process. We think we should just get to try temporarily owning a child for a while. Then we will know if we want to adopt them or not. We find the emotional boundaries of the adoption process frustrating. We want to get to enjoy the intimacy of feeling as if a child belongs to us during the process of deciding if we want to adopt or not. The government agrees a new system for children who are deemed old enough and mature enough to choose if they want to be part of it. The result? ‘Fadoption’ is born! …and then decides if they want to adopt or not. If they decide not to adopt they must ‘break up’. Many couples almost completely sever the relationship with the child after a failed fadoption. From one day to the next the child goes from being treated as a son to being treated as an ex-son. Churches soon accept Fadoption but teach that couples should not have the child live in their home before adoption as this is too intimate. Pete is one of the elders at a small Baptist church and decides, along with his wife, Mary, that they would like to fadopt Ben, a 13 year old orphan who attends his church. Ben is overjoyed when they ask him to become their fadoptive son and wholeheartedly accepts their offer. As is typical with fadoptions, Pete and Mary begin to talk to Ben as if he is their own son. Pete calls Ben, ‘My boy,’ and when Mary is asked if she is childless she says, ‘No, haven’t you met Ben?’ Their extended family also treat Ben like he is Pete and Mary’s child. Ben stays living at the orphanage but sees Pete and Mary many times a week. Pete and Mary text Ben numerous times a day, every day telling him how great they think he is. He texts them back expressing his happiness at being their fadopted son. They take family like pictures with Ben and post them up on Facebook. They encourage Ben to feel completely at home with them and they share their lives and hearts with him. After a few months they even tell him they ‘love’ him and Ben tells them he loves them too. Nearly everything about Pete and Mary’s behaviour suggests that they care about Ben, that they are committed to him and that he is their child. Ben finds it hard to trust Pete and Mary at first as he knows that fadoption’s can end, but through their treatment of him he soon let’s down his guard and get’s very attached. One and a half years after fadopting Ben, Pete and Mary decide it’s just not working out and that they won’t adopt. Firstly, Ben is a bit too emotional for their liking. In addition they were hoping that their first son might become a theologian but Ben ended up not being quite as intelligent as they would have liked. They just don’t feel adopting Ben is of God. Pete and Mary pray about it and decide to tell Ben it’s over and it’s best that they don’t spend any more time with him. This will help Ben find the ‘right’ family to adopt him. Ben is devastated. He had become nearly as attached to Pete and Mary as many children are to their own adoptive parents. Ben sees Pete and Mary at church each week. They seem to be doing okay but he is a complete mess. They smile at him but don’t really talk to him so as to give him the space to ‘move on’. They refer to him as their ex-fadopted-child. No one in the church seems to think that Pete and Mary have done anything wrong. After all, fadoptions don’t always work out and that’s just life. Better to end a fadoption than adopt and have it go wrong. Plus, Ben chose to be fadopted. Within 3 months, Pete and Mary decide to fadopt a new boy. Once again they treat this boy as if he were their own. Ben is in pieces watching them behave exactly the same with the new boy as they did with him. After 2 more painful failed fadoptions and a heap more emotional scars, Ben is finally adopted. He finds it very hard to trust and bond to his actual adoptive parents due to his past experiences, especially when he finds out that they had already fadopted 4 other children and rejected them before they chose to adopt him. His adoptive parents seem so used to getting attached to children and then breaking things off that Ben finds it hard to feel safe and free with them. Shani: We are to love our neighbour as ourselves. It’s terribly cruel to treat a child as your own, behave in such a way that encourages him to get deeply attached to you, and then reject him. I think fadoption is horrible and think Christians should stop fadopting. Christ loves orphans and I think fadoption must grieve him. Pete: Shani, the Bible never says we can’t fadopt. We can’t make up rules that are not in the Bible. Many wonderful Christians have had successful fadoptions that have led to great adoptions. Shani: Yes, and many wonderful Christians have experienced a fadoption ending in heartbreak. Look, with fadoption, a child is growing in intimacy, trust and oneness with a couple who quite possibly will never adopt them. It is very difficult for them to keep a guard on their hearts and keep from getting too attached in such an emotionally intimate relationship where the couple are referring to the child as their own and treating them as such. Pete: Yes it is. It is very hard to guard your heart in everything because the heart is deceitful above all things. Children guarding their hearts before adoption is a real problem – thinking this will be achievable by not fadopting is a false solution. Fadoption is not the problem but rather the hearts of the children involved. Plus, you are overlooking all the benefits of fadoption. You wouldn’t buy a car without trying it out first. Fadoption enables a couple to try a child before they adopt. Shani: How can you compare a child to a car! A child is not something to be tried and used! Pete: Fair point. But you overlook another huge benefit. Fadoption helps couples prepare for being adoptive parents by allowing them to get parenting experience with a number of different children before they choose ‘the one’ they want to adopt. Shani: At the expense of their ex-fadopted childen! Do you really think acting like parents and breaking up with a child helps prepare couples for adoption? Isn’t it rather helping them prepare to walk away if their adoption isn’t going the way they wanted it to. Pete: Okay, but fadoption offers couples the opportunity to figure out what they want in a child by getting to try different children out. Shani: Why is fadoption required for couples to work out what they want in a child? Fadoption is based on a lie: “you are mine”. The behaviour that is normal in fadoption is inappropriate and misleads children. Fadoption normalises children having had a number of people they were deeply attached to that broke it off with them. In fact, many children feel as if there is something wrong with them if they have not had at least one fadoption. Yes some fadoptions lead to adoption. Yes some fadoptions don’t damage children too much. But the whole idea of fadoption is just wrong. It normalises forming and breaking relationships contrary to God’s ideas of faithfulness. Enjoy the intimacy of belonging to them. Thus, as with fadoption, very many Christians will have unnecessarily experienced a major heartbreak. Marrying someone simply because they are too emotionally bonded to walk away. Breaking someone’s heart unnecessarily over a relationship ‘deal-breaker’ that could have been discovered without the pair getting emotionally attached. To the unmarried and the widows I say that it is good for them to remain single as I am. (1 Cor 7:8). …which presumes that there would not be any physical intimacy of a romantic nature. The Bible teaches that we should love our neighbour as ourselves (Mark 12:31) and that to love our neighbour is to do no harm to them (Romans 13:10). …that underpins our boyfriend/girlfriend culture is sinful at its core because it normalises damaging and hurting people. For thousands of years Christians have been getting married without holding to these two beliefs. My prayer is that more pastors around the western world will start teaching their singles how to get to know each other, pursue marriage and make wise marriage choices without embracing the two harmful beliefs explored in this article that are the very foundation of our boyfriend/girlfriend culture. You may be thinking, what’s the alternative? 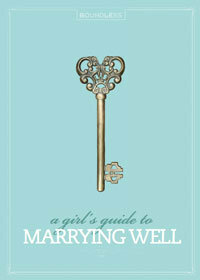 How can we move towards marriage without belonging to a person first? Our articles, ‘A culture of stirred up love‘ and ‘Boyfriends vs Courtship (What’s the difference)‘ offer some suggestions. 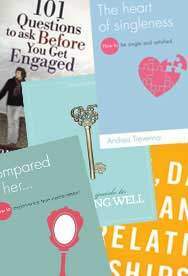 If you struggled to understand how the parable related to boyfriend/girlfriend culture, click here for a detailed break down. Have we accurately portrayed our girlfriend/boyfriend culture? Do you have a personal experience that relates to this article? Please let us know by commenting below. [Rowina Seidler. The image used in this article is the same one a pastor recently used in a blog post defending boyfriend relationships. 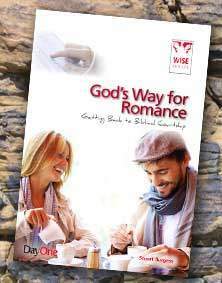 I chose to use it as I think it typifies the level of emotional attachment, physical intimacy and stirred up love that has become normal for many Christians to experience with multiple people they don't marry].